Water is life. The average American is recommended to drink 64 ounces or more of water a day, roughly half a gallon. What if you lived in rural Kenya and were told you could only drink half of that and instead of that water being fresh and clean it was brown, contaminated, and full of parasites? Unfortunately, for 14 million Kenyans, the heartache of drinking contaminated water is their reality. 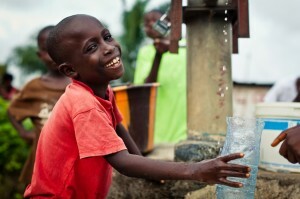 Over 80% of illnesses could be cured with a simple solution, clean water. Kenya Medical Outreach, also known as KMO, was founded in 2000 by Brad Williams. Today, KMO's mission is to provide clean water, healthcare, and discipleship for rural communities in Kenya to develop infrastructure for a sustainable, healthy future. In a partnership with Booster, KMO hosted the Water for Kenya 5K to bring clean water to Kenya. Booster is a for-profit company with a mission to "change the world." Booster's main offering is the Boosterhon Fun Run, an elementary school fundraising program that teaches students the value of fitness, leadership, and character. Booster not only impacts students in local U.S. schools, but also changes the world by supporting communities both domestic and abroad with annual giveback programs and company-wide service projects.